What a treat! It has been a little less than a month since the royal wedding of Prince Harry and Meghan Markle took the world by storm. After all the royal wedding hoopla was finished, Meghan and Harry jetted off to their romantic honeymoon at the Royal Retreat in Fairmont Jasper Park Lodge in Alberta, Canada. However, now that the honeymoon phase is coming to an end, it's time to start royal life. Harry and Meghan are speculated to be back in time for Saturday’s 'Trooping the Colour' event in honor of the Queen’s birthday. Following that, Meghan is getting a special treat - an overnight train ride with the Queen! According to the Royal Family's official website, Meghan and the Queen will make a joint appearance on June 14th in Cheshire, England. They will have numerous royal duties there, including an opening of a new theater (fitting for Meghan) and a lunch at the Cheshire Town Hall. 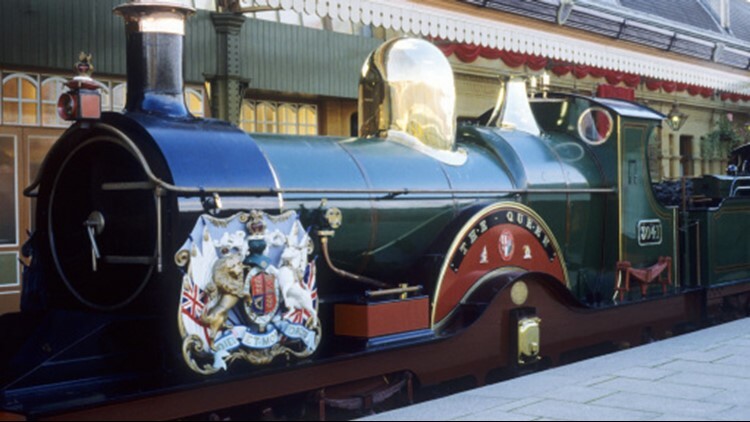 The royal train has nine-carriages currently in service and dates back to 1977 when it was used during the Silver Jubilee tours. According to The Daily Mail, "Her Majesty's personal saloon is 75ft long...It has a bedroom, decorated in light pastel shades, with a 3ft-wide single bed in one corner and a full-sized bathroom and sitting room." Sounds cozy! Meghan will have her own room and she and the Queen will share some uninterrupted quality time as the train goes slower than normal to ensure the there are no bumps. This overnight trip is a surefire way to win some royal points as the newest family member!